special thanks to my teammate for the help! 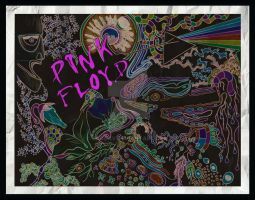 The Division Bell eye under the mising brick!!!!! Perfect!!! So I have the 3D poster of this... And your version? Love it sooo much! I'm jealous of your friend for having such a cool piece of art work. Question, is the hair ment to look like its going out/coming into the smoke stack? If so very very clever! If not, what a great accident! Awesome work! Love the subtle pieces here... the brick missing from the one girl, the fire, the 3-D horn, the hair in the large chimney... great stuff! this is so sweet.... it's like I'm really........ tripping balls..... it's cool. The only thing I could think that would make this better is if The Wall lady was bald. But this is still pretty damn awesome. I've seen a piece of work like this before at a comic book store. Was there an influence of sort? Oh okay XD I was just wondering.